Our Secret Sister program for the homeschool moms has now ended. It dawned on me a few hours before our last meeting (and reveal) that I should probably have a final gift for my secret sister. I quickly stole an idea I'd seen my friend Sally do. Sally is an awesome scrapper - she even made the cut of 50 for Making Memories Idol contest recently. My secret sis seemed to really like it though. If you'd like a Word doc with all the bible verses I used just drop me a note and I'll email it to you. 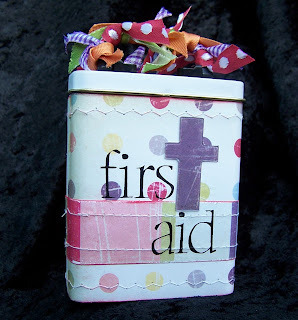 The bandage tin is from Provo Craft, The papers are Cosmo Cricket, and rub-on are Making Memories. The Cross is a Ghost Letter from Heidi Swapp. I used a lower case 't' and cut the bottom hook off. The ink is Tsukineko, the sewing machine Bernina and the ribbons are from various places. I think it is really cute. I would love to have a copy of the verses. I also have a wishblade template for the band-aide box. 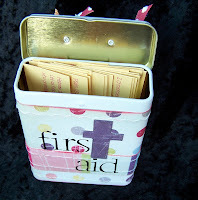 Sara, I am sorry I didn't get to your email sooner about the bandaid tins. There are days that I don't get to my computer. You should have called me! Very nice, Sara. Could you also send me a copy of the verses? I have a bandaid box just waiting for this here at home. This is so cute! Can you email me the verses, too, pretty please?